How to mention thought leaders in your blog posts. How to get thought leaders to participate in your blog and social media. How to be sincere with your mentions. Here it is, the blogging strategy so effective that you can’t afford not to use it: Identify thought leaders in your market and mention them in your posts. Now that you know what a thought leader is and how to identify them from “The blogging strategy so effective you can’t afford not to use it: Part 1,” let’s get to those six actionable items. 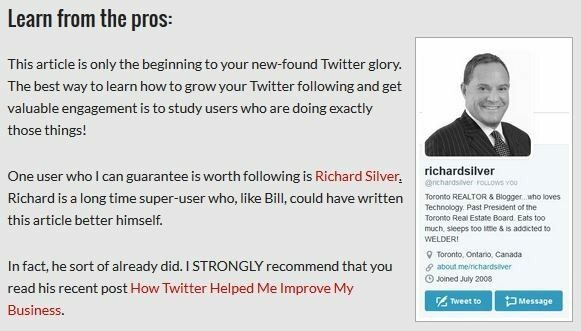 I recently published a post about how to grow your Twitter following in which I mentioned some thought leaders who I enjoy interacting with — two of which are Bill Gassett and Richard Silver. Honestly, Richard and Bill are both more experienced Twitter users than I am, and I couldn’t have confidently written that post if I hadn’t spent time observing their expertise. So, in the post I wrote exactly that and linked to their Twitter accounts and their blog content. They both shared with their followers and helped contribute to a nice spike in Lone Wolf’s blog traffic. Their shares made me a happy blogger, and I hope that Bill and Richard appreciate the shoutouts and have gained some new followers and traffic from the post. Everybody should be doing this. Pick a time interval that works for you, weekly or monthly, and shout out some great articles that you’ve read. Include pictures, links to the author’s primary social account (if applicable), a brief excerpt explaining why you selected the article and the link to the article itself. 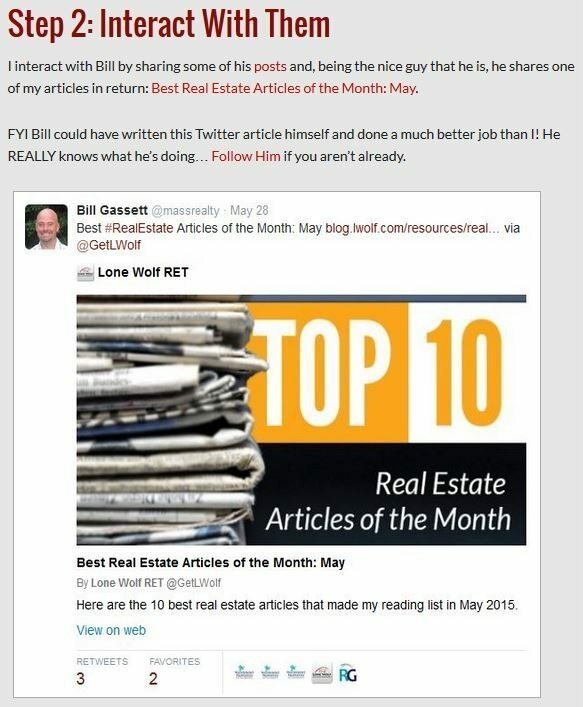 Let the thought leaders know via email or social that you selected their articles as “Best of the week (or month).” One of the thought leaders I mentioned in my June roundup was Kyle Hiscock of Hiscock Sold Team. 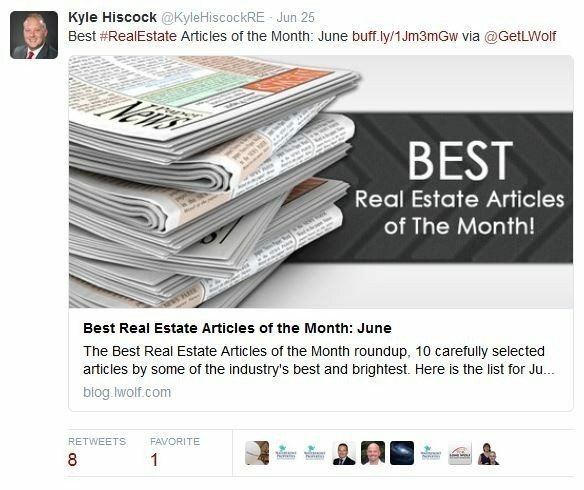 By commanding a blog that is frequently updated with premium content, as well as three highly engaged Twitter accounts, Kyle is by far one of the best real estate thought leaders I’ve come in contact with. I am grateful every day for his generous shares and retweets. This tip is probably the most straightforward example and one that I learned from one of my favorite blogging experts, Robbie Richards of Jacob Grant Property Management. The premise is simple: Your audience is interested in the content you share; so, of course, they will be interested in learning about other experts in your field. This post format allows you to mention a ton of influencers and, by its content-rich nature, is hardwired for positive SEO performance. 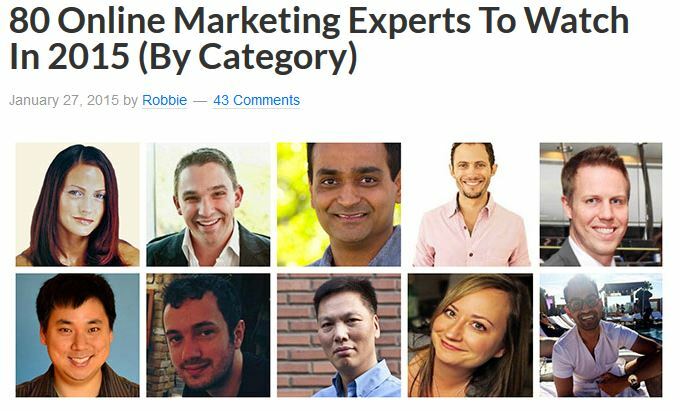 Robbie’s article “80 online marketing experts to watch in 2015” (by category) currently ranks No. 2 on Google for “blogging experts 2015” and is a veritable goldmine of information. Because he includes links to the three “top reads” for every thought leader he mentions, this post gave me access to 240 great articles about topics such as the one I am writing about today. That is the why I had that post set as my home page for quite some time. If your blog content is so useful that people are setting it as their home page, you must be doing something right. This blog is typically the most time-consuming shoutout post to create, but it can also be the most rewarding. Why? You must reach out to the thought leaders ahead of time and ask them to share their expertise or opinion on a topic. However, once an expert has taken the time to respond to you, they will be far more invested in the article and more likely to share with their audience. After all, they are thought leaders for a reason — they are skilled at sharing their knowledge and enthusiastic about helping people. *Note: You can also compile these posts simply by gathering prewritten content from the blogs of thought leaders, but they might not be as compelled to engage. This type of post also packs a ton of value for your audience, who gets quick access to the expertise of several experts in your field. 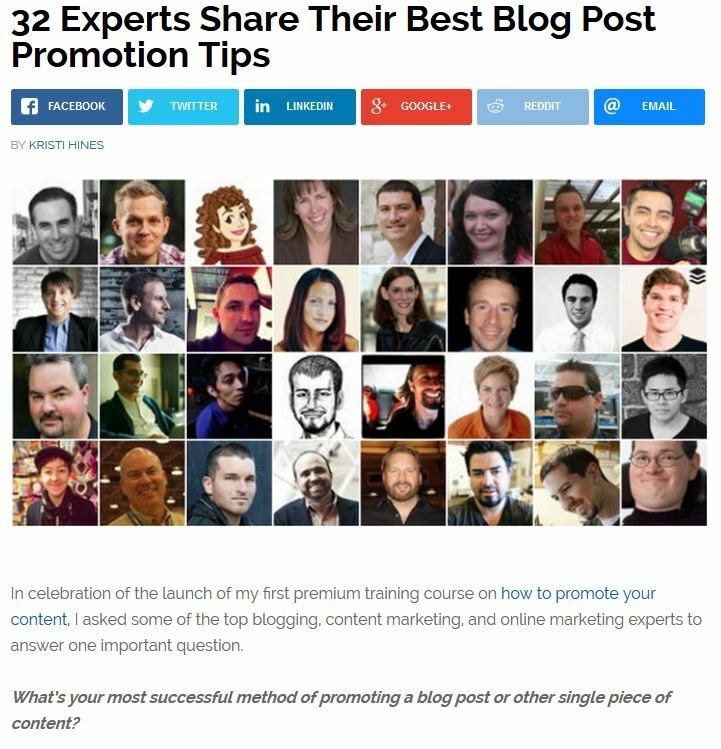 For example, Kristi Hines nailed it when she created “32 experts share their best blog post promotion tips.” This post was extremely successful for Kristi and for good reason — as a reader it’s rare that you encounter so much value packed into such a digestible form. These types of posts are worth bookmarking and reading over and over — then revisiting and reading again. This method is similar to No. 2 and No. 3. However, you focus on social accounts that your readers might like to follow. These posts are very effective because they are so actionable — if readers are interested enough to find and click on your article, it’s likely because they intend to follow the accounts you mention. This type of post also provides a lot of value to thought leaders, as it creates a direct follower acquisition funnel for their accounts. 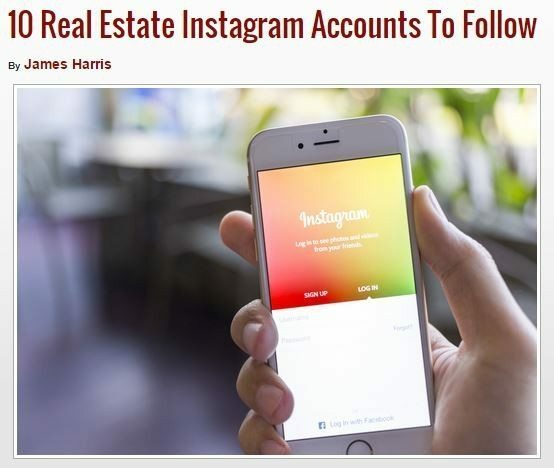 A great example of this post type is “10 real estate Instagram accounts to follow” by James Harris. Because it delivers exactly what the title promises, this article has been popular with readers and has indexed as the first Google result for “real estate Instagram accounts,” and resulted in a steady stream of traffic to the Lone Wolf Blog. I’ve saved this example for last because, in my opinion, this is the most logical strategy for real estate professionals to implement, and I want it to resonate with you. You sell real estate in a specified area, so what could be more valuable to you than being regarded as an expert in that market? These types of posts can be timely or evergreen, and there is an infinite range of potential: best restaurants, best places to buy a certain product, best upcoming free events, best upcoming sporting events, best outdoor attractions — these possibilities are endless. If you are already following some real estate blogs, you’ve likely seen this strategy in action. 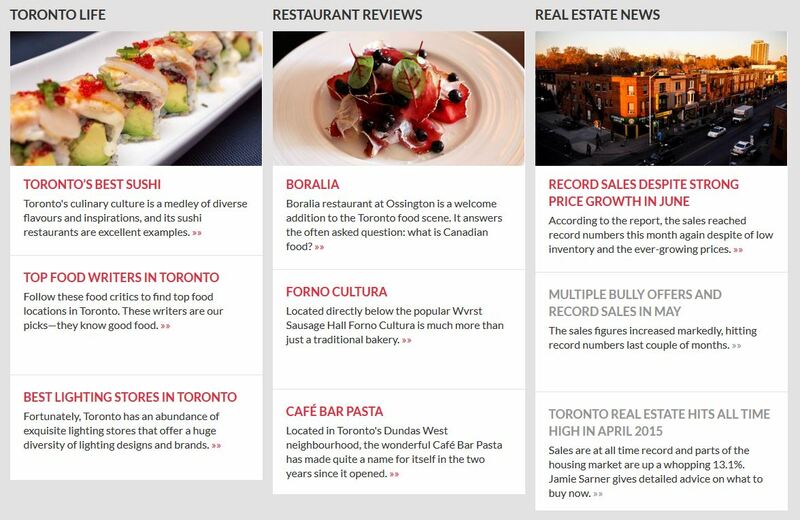 One great example is Jamie Sarner, who offers a wealth of information about Toronto on his website. Just look at the screenshot below from his home page. If you want to win the trust of potential homebuyers in your market, this is how to do it. Mentioning thought leaders in your posts is an invaluable method of adding additional value and resources to your posts, reaching new audiences and forming relationships with talented experts. This all relates to my absolute favorite aspect of blogging: that blogging is unselfish. Everybody has a self-interested agenda, but in a crowded digital space the only way to achieve true success is through generosity and collaboration. In a crowded digital space, the way to achieve success is through generosity and collaboration. Start mentioning thought leaders — let them know that you appreciate what they’ve done and that you’ve benefited from their knowledge. Soon enough you might be the thought leader being mentioned by others. It’s a big, confusing world, but I can assure you it gets a lot smaller once you take the leap and start reaching out to people you respect. Some will be too busy to respond or to share, but many will appreciate the mentions and will share, while others will become mentors and maybe even friends. I use the term thought leaders loosely here. Don’t seek people merely because they have a large following — that’s shallow and a poor long-term strategy. If a person (or organization) does something great but doesn’t yet have a large following, you are doing them, your audience and yourself a disservice by not sharing their work. You never know who the influencers of tomorrow will be, so give credit where credit is due and make a habit of reaching out to anybody who interests you. You never know who the influencers of tomorrow will be, so give credit where credit is due.